Lose yourself in the pages of this exciting historical novel as you follow the adventures of Billy Gogan, an Irish orphan sent to America on the eve of the 1844 Irish Famine. Discover the dangers he faces as he lives by his wits, and does what he has to, to survive…. The author of this exciting adventure story, Roger Higgins was born in Cheshire, England, and he emigrated to America with his parents and younger brother just before he was seven. Today he lives with his wife in Chicago, Illinois and is immensely proud of his four children. He served on a guided missile destroyer and other ships as a naval officer, he then became a lawyer, and had various other jobs, eventually becoming a partner at a firm with the grandest bankruptcy practice of them all. He still practices law on a smaller scale and enjoys writing novels. 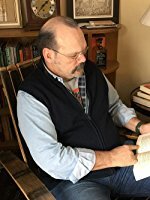 It is this diversity of knowledge, and life experiences which the author has used to full effect in writing the story of Billy Gogan – American. The book begins with the 15 year old Billy Gogan in school, however, suddenly his life changes forever when he learns that his father has died in mysterious circumstances in prison. Following this devastating news he is informed by Father O’Muirhily that he must leave his native Ireland and start a new life in America. Passage has been arranged for him on the Maryann. Forced to travel in steerage he meets in the boarding queue Mary (Máire) Skiddy a young widow, and her young daughter Fiona. When a sailor mistakes them for a family they are bunked together, and a firm friendship is formed. However the voyage hasn’t even begun before Billy witnesses the death of Father O’Muirhily on the quay, but was he pushed, or did he fall? The vividly descriptive historical writing of this author enables his reader to really get a feel for the lives of his characters. The harshness of life on board ship, the living conditions, and the terrible weather they endure during the voyage, are acute reminders of what travel used to be like. When the Maryann eventually docks in Gotham, New York, Billy Gogan is distraught to discover that he has become separated from Mary and Fiona. Despite various attempts to find them, he is unlucky, the Five Points district of New York is a dangerous blend of ex-slaves, Americans, and Irish refugees, he can only hope they are safe. Through Billy we discover what it was like in those times not only to travel to and survive in a foreign country, but also to make a new life, and learn about love, hate, and the myriad of emotions in between. I thoroughly enjoyed this wonderful historical novel and am looking forward to discovering what happens next in the life of Bill Gogan – American. Roger J. Higgins and his wife reside in Chicago, Illinois, and they are immensely proud of their four children, one of whom is a serving U.S. Marine, and one of whom is Marine turned police officer (happily married to a wonderful high school chemistry and biology teacher). Their daughter is a nurse, and she and her husband (a retired Coast Guard officer) are the proud parents of a baby boy. Their youngest son is an aspiring doctor. As Mrs. Higgins has patiently observed to her husband when he ruminates about the trials and tribulations of raising children, it was together that they went four-for-four with their children, hitting safely at every at-bat. Not a bad day in the batter’s box. Roger was born in England, in the County Cheshire, where he learned early of the orange-striped Cheshire cat, which disappears, leaving only its grin, full of teeth and gums. Roger emigrated with his parents and younger brother to the United States when he was 6 ¾. When his mother registered him at the local elementary school, he saw fit to wear his English grammar school uniform, which looked a lot like Harry Potter’s, except his cap was gray with purple piping and topped by a purple button, and he wore gray short trousers, gray knee socks and a purple clip-on tie with his dark gray blazer. After his mother finished registering him for school, the principal gently asked whether he would like to leave the tie and cap with her for the day and pick them up after school. Roger demurred. He was fortunate enough to retain both tie and cap (which were never worn again) on the walk home from school. Roger learned the art of leadership from his ships’ commanding officer and executive officer, who together led the tired, old ship, which was a bit of a laughing-stock along the waterfront, to win the Arleigh Burke award as the best destroyer in all of the Pacific Fleet. Roger served another fifteen years after that, having had during that time the privilege of being the fire control officer for the U.S.S. Missouri’s 16-inch guns, and thus the only naval officer in the world (at that time) under the age of thirty proficient in the ancient—and wonderfully obsolescent—art of major caliber naval gunnery. The Billy Gogan story is a fictional memoir told by an old Army general of his adventures as a young man. 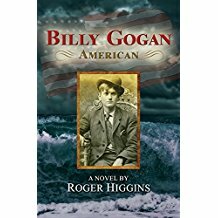 Billy Gogan, American, opens with recently orphaned Billy Gogan fleeing Ireland on the eve of the Great Hunger — either because he is the son of a dangerous revolutionary, or because his cousin doesn’t trust him around his daughter. Billy befriends a destitute Irish peasant named Máire and her young daughter Fíona, and together they endure a harsh passage to New York, America’s greatest city. They get separated as they debark, and Billy searches tirelessly for them in the dangerous Five Points, ground zero in the collision of Americans, ex-slaves, and Irish refugees. Here, Billy completes his education. Already able to declaim Cicero and construe Aristotle, he learns voting fraud from Bill Tweed, the future head of Tammany Hall, and the numbers game from Charlie Backwell, Tammany’s top bookie. Finally, Brannagh O’Marran, the beautiful mulatta daughter of the Irish madam of Gotham’s finest brothel, teaches him about love.